Am Lily Douere Bandotubo , single and i was born 15th July 1989. I am walking with the aid of steel crutches (physically challenged) from Warri South West Local Government Area in Delta State of Nigeria. Am an Agriculturist, an Entrepreneur, An Author and a Mentor. In 2007, i acquired my National Diploma(ND) certificate in Agricultural Technology with Upper Credit at Delta State Polytechnic, Ozoro. In 2007, 1 also acquired a certificate in Office Management from Niger Delta Development Commission (Youth Empowerment Programme) with Interlink Technologies and Management Systems (NIIT). In 2010, I gained admission to study Medicine and Surgery in Niger Delta University, Wilberforce Island – Bayelsa State but unfortunately I could not cope after the surgery in my lower limbs and that led into Entrepreneurship. In the 2015, I applied for Skills Training and Entrepreneurship Programme(STEP) organized by Delta State government and I was shortlisted for the Entrepreneurship Programme. On January 14th ,2016 I was awarded with the certificate of recognition as the best trainee and on January 15th I was also awarded the completion of training certificate of Catering and Confectionary under the Skills Training and Entrepreneurship Programme (STEP) from September to December 2015 by the OFFICE OF THE CHIEF JOB CREATION OFFICER, GOVERNOR’S OFFICE, ASABA NIGERIA. 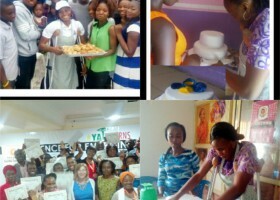 In 2017, I also acquired a YALILEARNS Certificate of Participation under Food Processing at the conference for Emerging Entrepreneurs in Lagos State held from 28th – 29th March, 2017 by Omowale Ogunride, the director of Field of skills and Dreams and Darcy Fyock Zotter, Public Affairs Officer, U.S Consulate General, Lagos State – Nigeria. I am YALILEARN member and I have also acquired various online certificates that have build my knowledge and I have also been certify with the online HTML fundamentals course Certificate on the 17th November, 2016. I am the author of the book titled POETRY OF INSPIRATION WITH COMMENTARY ON WORDS OF WISDOM, VOLUME 1 and the book was published 2010. I am the Project Manager of GLOBAL ICONS YOUTH ENTREPREURSHIP TUESDAY(which is on faceback page) comprising of different skills to empower youths, it is mainly every last Tuesday of every last month with only two hundred as registration fee. I am one of the admin(staff) of KITCHEN AVENUE NIGERIA (which is on facebook page) also a group that empowers people through on ground trainings, WhatsApp and Facebook. COMMUNITY AND YOUTH EMPOWERMENT THROUGH ENTREPRENEURSHIP PROGRAMME.